Clearly Swami was not in a good mood, like so often in the recent past. His holdings in the funds managed by Jain (who was portrayed as a star as his schemes had beaten the market for most of the past one and a half decade) had made him unhappy. Amid Swami’s spell of fury, my broker friend was nonchalant as usual. Swami was looking up to him waiting for him to respond, which he finally did. That foxed both Swami and me. That kind of appreciation for fund managers and their skills, especially when Swami was complaining that they were not performing was more than what we could handle. Clearly many of them had failed to beat the market indexes over the past couple of years. Many who used to be stars had dropped to the lowest rungs. Moreover, how can someone fail because he is so good? We were taught that you fail because you are no good. “What does cricket have to do with my non performing funds?” fumed Swami. Swami was getting a bit impatient as the discussion seemed to have suddenly turned from Jain’s non-performing funds to cricket. Jigneshbhai continued, even while we wondered what he was trying to say. “So what’s the point?” now an increasingly impatient Swami asked. Not quite convinced, Swami looked at me. I did not have any idea how to react, but intuitively it sounded a bit perplexing. 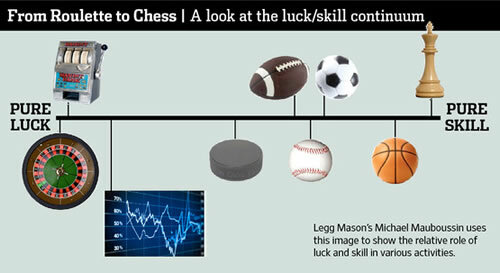 That the more skills you have, the more luck plays a role? Not quite something that fitted our mental models. Swami and I were listening and seemed to get a bit of it now. So it is like a class of toppers – where there is so little to choose from among a bunch of bright folks. Who tops perhaps depends more on the paper they get than their skills. While we were trying to digest it, Jigneshbhai continued. It started making some sense. Maybe there was some logic to it. But Swami was still paying the fees and still disappointed. We were still wondering what it meant for us. “So what does it mean to us?” popped up Swami. Just then, the wealthy man from the sprawling bungalow who had been listening to our conversation for the past few minutes dropped in to our table. A voice of sanity and wisdom among all the noise in an environment of pessimism – here is a note from HDFC Fund Manager Prashant Jain sent out to investors.